In the previous article, "The Importance of a Website's First Impression", we discussed how we can increase page views per visitor, and reduce the bounce rate just by using an attractive design to grab the visitors attention. In this article we will explore one of the negative consequences of the changes we made, a fall in conversion rates, and how we solved the issue. The website in question hosts files for a popular guitar tablature software, Guitar Pro 5. One of the revenue streams for the site was via selling the Guitar Pro 5 software, upon which a small commission was paid. Link Location - The location of the link to the promotional page, "What is Guitar Pro? ", had changed (shown in the images below). In the original dessign it was built into the main navigation bar, whereas now it was pushed to the outside of the main content area as a vertical link. This may have reduced the visibility of the link, which would in turn lead to less traffic being sent to the affiliate website. Colour Scheme - Although content on the promotional page had not changed, the colour scheme of the site had. This could have lead to the content being harder to read, deterring the visitors from reading the full promotional copy. Links - Links on websites are shown as underlined blue text as default and users have become accustomed to this. As the links on the site in question are shown in orange, they could be facing difficulty identifying them as links. After further analysis using Google Analytics, it was found that there was a indeed a significant drop in the number of visitors that viewed the promotional page ever since the design change on the 6th of January 2010. As with any form of advertising there is a very fine line between informative and spammy advertisements. We therefore decided to add a limiter to the ad to ensure that it was only shown once every three days. We also made sure that the adverts were not shown to members, as it is completely irrelevant to them. 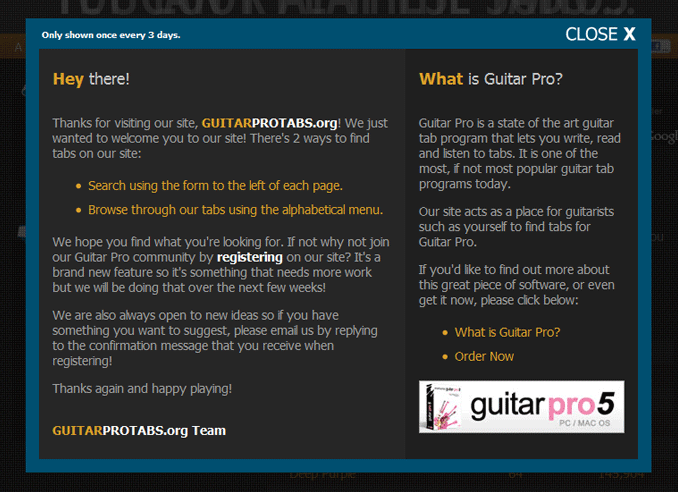 The interstitial ad was split into 2 columns - the left encouraging visitors to register, and the right to tell them more about the Guitar Pro 5 product. A large close icon was added to allow the user to close the ad quickly in case they weren't interested, and we also added a little text to inform them that it is only shown once every three days. After the interstitial ad was added to the live site, the effects could be seen immediately. Although the number of page views of the promotional page had not increased significantly, there was a dramatic increase in the number of people visiting the affiliate website (via a direct link in the interstitial advert). The number of registrations per day also increased from an average of 6.50 to 9.16 new users per day.